The names of two 17th century makers took these two lantern clocks way above estimates at Sworders’ (23% buyer’s premium) sale at Stansted Mountitchet. Both were from the Barbara Holliday collection that majored on Modern British art (see Art Market, ATG No 2377). The 1670s ‘Third Phase’ winged lantern clock was engraved to the dial Wm Speakman, London and appears to be one of only four recorded lantern clocks by the Hatton Garden maker. Typically, at some point the original balance wheel had been converted to a verge pendulum movement and some wheelwork had been replaced, but the 14in (36cm) tall clock was in unrestored condition and in working order. Against a £1500-2500 estimate it sold to a private buyer at £4600. 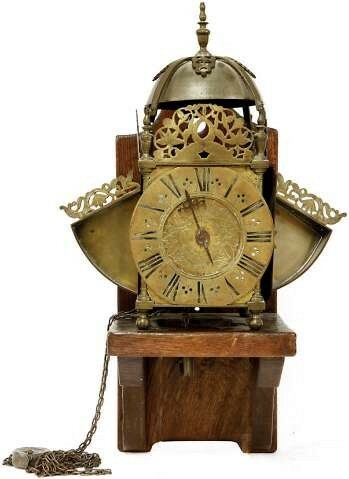 The other lantern clock at the January 15 sale was a12½in (32cm) brass clock featuring an alarm-setting disc and a weight-driven movement. It was signed to the dial Gulielmus Clement, the signature of the inluential London maker William Clement. This would make it an early work for Clement who later turned his craft to longcases. Credited with designing the anchor escapement in 1671, in the same year he built the turret clock for King’s College, Cambridge (now in London’s Science Museum). No doubt the English collector who bid a quadruple-estimate £2000 for it will now be doing research to firm up the attribution.